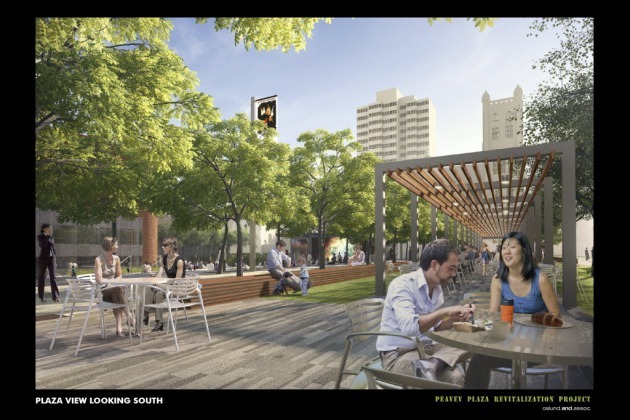 Opponents of the Peavey Plaza project are not going away quietly. 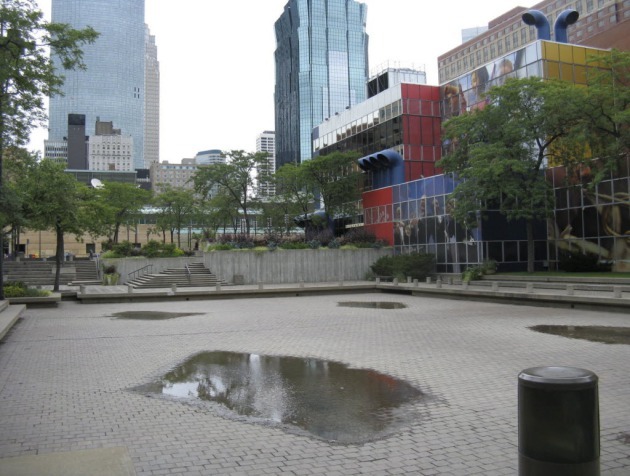 The Cultural Landscape Foundation and the Preservation Alliance of Minnesota have filed suit to stop the City of Minneapolis from remaking the plaza along the Nicollet Mall, between 11th and 12th Sts. The groups claim that Peavey deserves preservation as a natural resource under the Minnesota Environmental Rights Act. The suit was filed in Hennepin County District Court. The opponents dislike the extent to which Peavey would be rebuilt. They contend that a less-severe alternative proposal by M. Paul Friedberg, who designed the original plaza, would better respect the existing structure. The Landscape Foundation and the Preservation Alliance have charged that Friedberg’s option was dismissed without good cause. A view of the new design by Oslund Associates. In April, the Minneapolis Heritage Preservation Commission recommended denying the project. The city council overturned that decision and reaffirmed the new design by landscape architect Thomas Oslund. The refurbishing of Peavey is intended to accompany a $50 million reconstruction project at the adjacent Orchestra Hall.